Normally we wouldn’t think of a ‘how to’ book being a big Business app. This little ‘how to’ instructional book seems to have caught on as can be seen by little dollar animals floating around meetings. 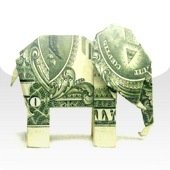 The cause is a ‘book’ app for the iPad on how to fold (origami) dollar bills into many different animals and things. The package includes 10 projects and 2 extra (not sure why that isn’t just 12 included…) and is “50%” off right now… making it a 99 cent app. The only reason we mention that is because is struck us funny to spend a buck to fold a buck. Maybe you had to be there… it was funny at the time. 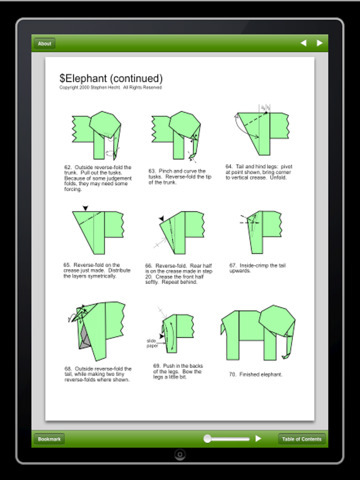 Lessons for each creation is presented with multiple fold pictures per page across several pages. Any of which can be bookmarked so you can come back later to finish up what you started if your called on to speak in a meeting. Around home it could be a hit too, though you may want get crisp new dollars if the kids will be folding since you never know where money has been. Dollar Bill Origami isn’t really an official ‘time waster’ since in the end you have a talent and actually create something. So far, it’s been a bit of fun a bunch of us are having. Long term, it might come in handy to know a few of these when at a restaurant dinner meeting to make something to impress or start the conversation. They most likely will want to keep your creation so it could get expensive at a dollar per art bit if everyone at the table wants you to make something for them!